Barack Hussein Obama, hmm, hmm, hmm, has made a deal with Iran that guarantees World Peace! Obama says the Iranians have promised not to make nuclear weapons. 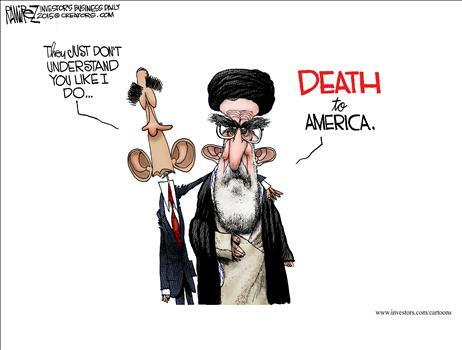 The deal is a verbal agreement between Obama and the Iranian Ayatollah. The Ayatollah immediately announced to his people that they would have a nuclear weapon with which to destroy Israel in the next two years. He chanted, “Death to America!” which the Obama spokesman says was just him playing it up for his base, like the GOP and the TEA Party. Obama says there is no threat from Iran. Let us give thanks and great praise to Allah for Obama’s deliverance of America from the threat of Iranian nuclear weapons being put into the hands of terrorists. Our great president has lived up to the world’s expectations and more than earned his Nobel Peace Prize! Without a doubt, America has been rendered safe from any future terrorist attacks and the threat of nuclear war. Israel can take heart from America’s example. This entry was posted in Islamism, Obama's legacy and tagged America, Barack Obama, Death to America, Death to Israel, Iranian nukes, Islam, Jihad, Nobel Peace Prize, Nuclear Jihad, Nuclear weapons for Iran, Obama diplomacy, Obama's deal with Iran, Terrorists nuclear weapons, World Peace. Bookmark the permalink. 3 Responses to Obama achieves World Peace! PIECE OF CRAP! If you believe that, you believe that I have a BRIDGE TO SELL YOU IN ARIZONA!! LIES from a LIAR-in-Chief! He wants Iran to destroy Israel! Count on it! Lord Neville Chamberlain gives your article two thumbs up! !